LED Indicators very clearly show the inverter/charger status. The LCD display is a 16 x 2 line (32 characters total), alphanumeric display used for programming the inverter/charger operation and viewing current status or fault messages. Two ON/OFF buttons allow the inverter or charger to be quickly enabled or disabled. 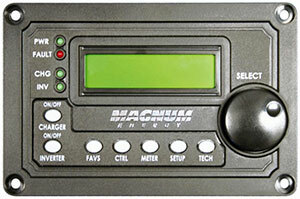 Five Menu buttons allow the inverter or charger to be configured to your specific preferences. Menus give simple access to monitoring and troubleshooting your inverter/charger system. Rotary Knob / SELECT button - Like a dash radio knob, the rotary encoder knob is used to quickly scroll through and select various menu items and settings. By pushing you can “SELECT” a menu item or “Save” a setting once it is displayed on the LCD screen.